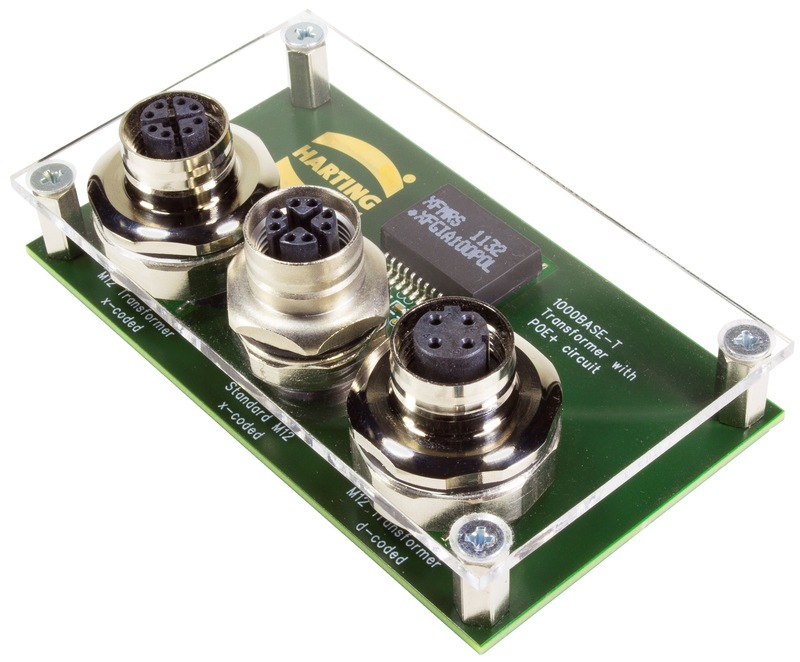 Power-over-Ethernet, data flow and transformer all combined in one M12 Magnetics connector from Harting. Transformers in RJ45 sockets required for Ethernet have been known for a long time – but connector manufacturers have not been able to offer the market an IP65/67 protected unit consisting of socket and transformer. With the new M12 Magnetics, HARTING has offered now just that. The M12 socket contains transformers and all the other necessary components that would otherwise have to take up space on the circuit board – and all in the same size socket as before. Integral transformers in IP20 protected RJ45 sockets have been in industrial use for a long time now. To give customers the benefits of saving space and mutually compatible Ethernet components to miniaturise their field applications, HARTING launched the M12 Magnetics at HANNOVER MESSE 2017. Greatly increased reliability is a further benefit to our customers. In the past, sockets and transformers made by different manufacturers had to be combined, which could sometimes be problematic. The HARTING product is a mutually compatible unit providing greater process security. With 10Gbit and max PoE+, M12 Magnetics is the ideal miniaturised interface for Power and Data.